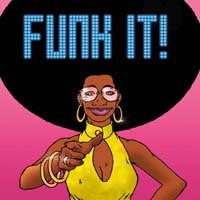 Instinct Records returns to the funk/soul arena with FUNK IT! Presenting a collection of vintage booty shakin', rhythm lovin' grooves, FUNK IT! Will accentuate any party or discoteque. STYLIN' ARTISTS! FUNK IT features tracks from legendary James Brown songwriting partner BOBBY BYRD, HUMAN BODY (ROGER TROUTMAN OF ZAPP & ROGER) and POETS OF RHYTHM (Quannum Projects, SF). Also featured are original raw soul pioneers BO BARAL, THE WHITEFIELD BROS. THE MIGHTY CONTINENTALS and THE BUS PEOPLE EXPRESS. FUNK IT! is filled to the brim with James Brown-inspired grooves and soulful tunes.